Nestled in the beautiful Sierra Nevada Mountains about 60 miles east of Fresno, California, Shaver Lake lies at an elevation of 5,370 feet. The lake was formed on Stevenson Creek with the construction of Shaver Dam built by Southern California Edison and completed in 1927. 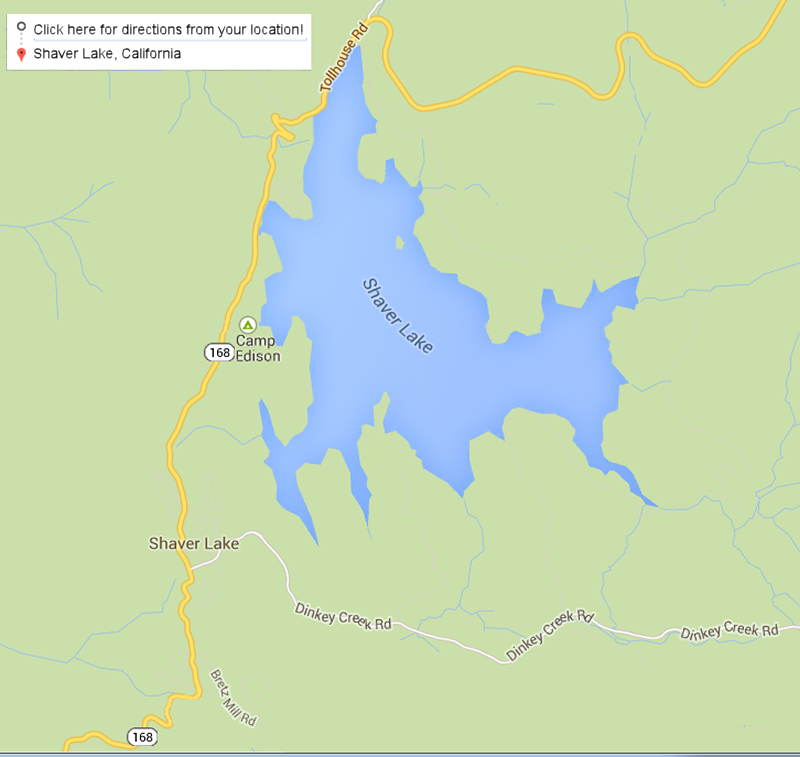 Shaver Lake contains about 2,100 surface acres of water and is surrounded by 15 miles of granite covered shoreline. People come to visit for the hiking, fishing, boating, and water recreation the lake offers. Full service marinas and launch facilities are available. The lake contains a good population of Kokanee, a fresh water Salmon, and Rainbow Trout. The lake also has Brown Trout, Small Mouth Bass, Catfish, Blue Gill, Brook Trout, Carp and Crawdads. This body of water is planted regularly by the Department of Fish and Game and Southern California Edison. All boating is permitted as well as jet skis, water skiing, and swimming. The current town of Shaver Lake evolved from a lumber mill community to its present mix of eclectic businesses serving the local and tourist population. The town is home to about 1000 permanent residents, but during the summer season that population increases to around 5000 people. The population also increases during the snow ski season, but in fewer total numbers. To learn more about the history and the area please contact The Shaver Lake Visitors Bureau or The Central Sierra Historical Society for more information.